Mag-guns are pretty impractical, but they're always fun to fire. Larsplatoon knows first-hand. A few years ago he put together a crazy single-shot coilgun that tore up household appliances one 1.25 kilojoule shot at a time. Now, he's opted for full auto. And it's just as fantastic to behold. 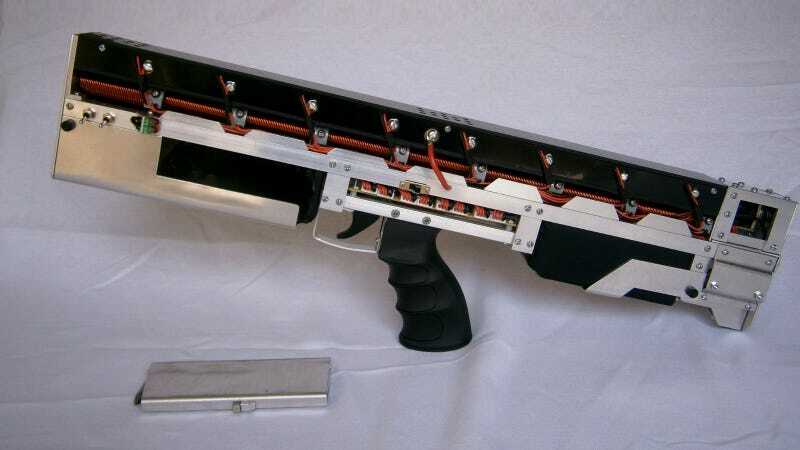 This DIY gauss rifle—or CG-42 Gauss Machine Gun, as Larsplatoon calls it—relies on a few different things to get those bolts flying. First, you've got a barrel full of electromagnets that systematically switch on one after the other to fling magnetic steel bolts out of the non-magnetic aluminum barrel at crazy speeds of 15 shots every two seconds. But those magnets don't just flip on and off themselves; each of the links in the magnetic chain needs its own infrared sensor that can see a bolt coming down the pipe. When it spots one on its way, it flips on for just long enough to add a little force before switching right back off and getting ready for the next one. It's like a high-speed magnetic strobe light, and it only works if its precisely timed.